Whether you are a large or small medical device company, you share the same challenge: getting to market requires a lot of resources that you may not have. J-Pac gives you a turnkey medical device outsourcing solution that gets you to market faster because you focus on product development while we focus on the headaches of manufacturing. Many medical device contract manufacturers have grown large through vertical integration. Unfortunately, this caused a lot of them to be lethargic and unresponsive. Rather than vertical integration, we use an Agile Supply Chain based on virtual integration where best-in-class suppliers are managed and coordinated while we focus on the pain points. Our expertise is resolving the typical culprits that delay product launch: package system development, sterilization validation, process validation, label control, and supply chain management. For us, speed, quality and cost control are not mutually exclusive because we remain nimble. Because we are experts in the total supply chain coordination and not beholden to specific component technologies, we can handle a large variety of medical device product lines. We have particular expertise in three broad categories. 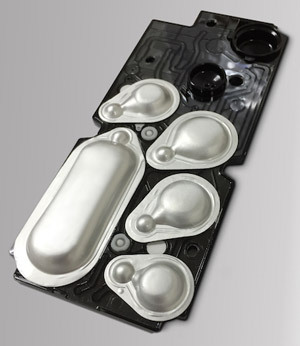 Consumable Single-Use Medical Devices that require assembling multiple plastic and metal components into custom packaging that is often sterilized. 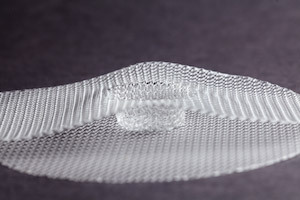 Implantable Medical Textiles involving anatomically correct, particulate-free implantable device, drug-device and bio-absorbable polymers. Diagnostics Reagent Blisters comprised of cold-formed foils filled with reagents and designed to meet specific dose activation and microfluidic interfaces commonly used in point-of-care diagnostic tests requiring lab-on-chip consumables. We offer extensive manufacturing services and a broad array of manufacturing technologies. If we don’t have a specific technology, we either find good suppliers or invest in the technology ourselves. 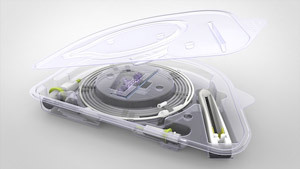 Custom designed diagnostic reagent blister for microfluidic-based diagnostic tests.